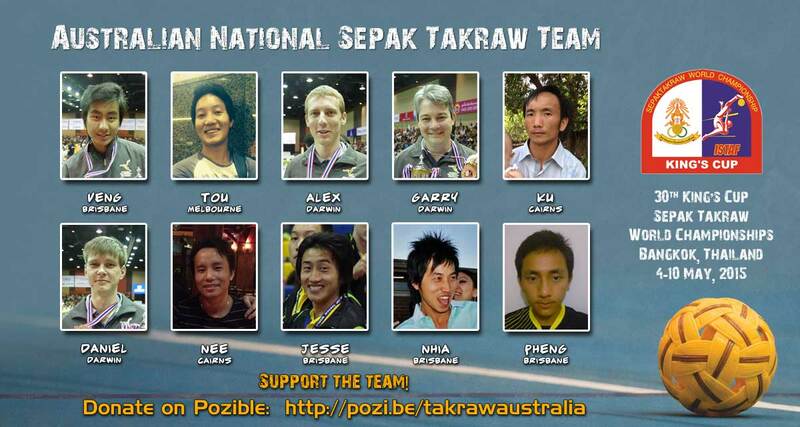 Takraw Australia - King's Cup 2015 Team Announced! King’s Cup 2015 Team Announced! The Australian team for the 2015 King’s Cup World Sepak Takraw Championships has been confirmed and entered into the annual world championship which is to be held in Bangkok, Thailand between the 4th and 10th of May this year. We’re sending a squad of 10 players, and for the first time ever Australia will enter all four events at King’s Cup – Regu, Doubles, Hoop, and Team Event. This is year of firsts for the Australian national men’s team as this is the first year we’ll be entering all four events, and the first year we’ve had players from Cairns join the team. Six of the players in the team have previously represented Australia, whilst four of the players are new to international competition.We hope by sending such an ambitious squad that we can encourage more people in Australia to support and participate in the sport of sepak takraw. if you’re interested in a commercial proposition for our team. Click here to support the team by donating on Pozible!